...I wanted to share my family’s story with the Coast to Coast AM audience…it should make a nice addition to the pile of growing evidence of a NASA UFO cover-up. My paternal grandmother, Norma Rispo (maiden name Vladyka), had a brother named George Vladyka. Their Vladyka family grew up in the Cleveland, Ohio, area. Soon after graduating high school, George went to work for the NACA Research Lab (which eventually became the Lewis Research Center and now is called the NASA Glenn Research Center today). This began his career, which would span roughly from the 1940s to the 1980s. 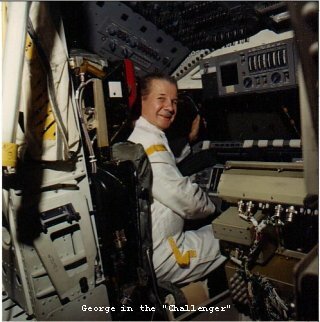 George experienced the commencement of NASA and found himself relocated to Cape Canaveral (Cape Kennedy), Florida, at some point in the middle of his career. I think the George Vladyka story is significant in two ways. It confirms that NASA is covering up UFO evidence. (Where are all those photos that the public paid for?) It also establishes the connection between NASA and the Pentagon. It would appear NASA does NOT answer to the public—-rather the Dept. of Defense. George passed away sometime in the early 1990s. Norma passed away in 2005. Therefore, I have no regrets passing this story onto you.